5-Minutes to skiing: On Stratton -Near by: Bromley, Okemo, Mt.Snow 40 Min. A party's delight! 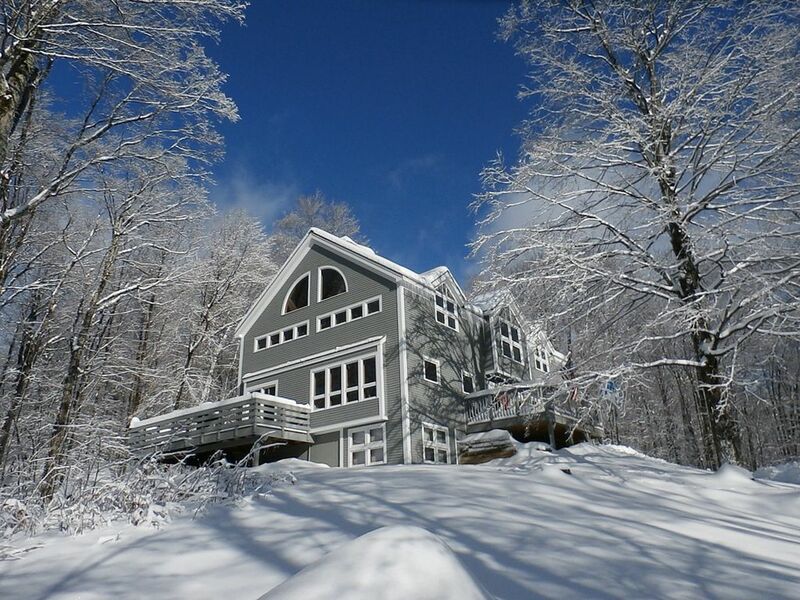 Gorgous ski home... Minutes to Stratton Mountain. Extraordinary soaring ceilings with a huge 3 story center stone fireplace. Sleeps 14-16 -Four bedrooms, 2-Great rooms. 3425 square ft. Plenty of room for a your group...or nice and comfy for two. Dining rm. -3-stories high- seating for 14. (great views of Stratton Mountain. Living rm. 2-sofas and multiple chairs. (great views of Stratton Mountain, stone fireplace/3-stories high. Ski and Snowboard Room: w/commercial boot dryers, ski & snowboard racks, shelving, jacket racks and bench. Large bathroom w/ double sinks, shower and whirlpool tub. Lower level: Bedroom (King size bed) with floor to ceiling stone fireplace, Full Bath, LCD TV, Daybed with pull out. Parking: 8 Autos and or SUV’s (up at the house) Additional parking at street level. Seating for 4 at the breakfast bar. Ski & Snowboard Room ski & snowboard boots dryers! Bring in your boots, mitten ski & snowboard. Ski and Snowboard rack. Jacket rack and shelving for all your other ski gear. This lovey mountain home is fully furnished with 2- master bedroom suite, ea. with a flat screen TV. 2nd. fl Great Room w/flat screen TV. Fully equipped Granite counter top kitchen with brand new stainless steel appliances. A Huge 3 story center fireplace, 2-Great Rooms. Views of Stratton Mountain from the 1st. fl. Great room. Ski Room w/booth dryers, ski rack, jacket hooks & bench. We had a great stay all across the board! Great mountain house. Close to mountain and very warm and inviting. Loved the fireplace. Comfortable stay for 14 people! Awesome house and a great location!! The weekend I stayed happened to be a blizzard, by morning the drive way had already be plowed and we were one of the first cars on Stratton Mt. Overall one of the best skiing experiences. We had a wonderful time at this beautiful VRBO. The home is close to the mountain with all the eminities, but bring your own coffee pot (several false coffee starts with the multiple coffee pots offered so we purchased a new one in Manchester). There’s no hot tub but we enjoyed the gorgeous fire places and tv cubby upstairs. Dining and eating areas we’re fabulous and all the bedrooms are comfortable and spacious. I would highly recommend! The ski house perfected. You can preview the conditions on near every run of Stratton through your binoculars before making the drive only a few minutes up the access Rd. to enjoy it first hand. The house is thoughtfully furnished with local pieces throughout. The kitchen is modern, well equipped and able to accommodate large groups. There is a ski room immediately off of the entry with a commercial boot and glove dryer that, along with all the space for equipment, really adds that extra touch of convenience to the whole experience. I have stayed here a number of times and it is always pristine, I look forward to my next trip up. Fantastic Weekend in luxurious setting!! When I received my invitation to spend the weekend at a mastermind event in Vermont, I jumped at the chance to enjoy the magnificence of Vermont in the fall. When I arrived at the house I was blown away by the warmth and elegance of the house, and the breathtaking views of the mountains. 13 of us spent 3 days together learning and laughing and at no point did we feel cramped... the house is so spacious!! I spent time hiking the mountains and was so relieved that after a exhaustive climb, a hot relaxing shower was only 5 minutes away... this place is amazing!! !